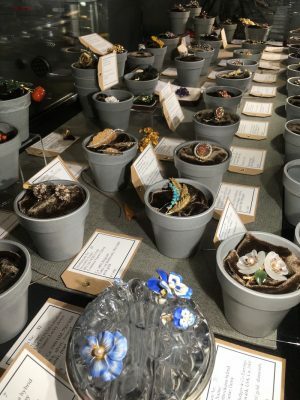 4 – 7 April 2019: Birmingham Art and Antiques for Everyone Spring Fair. G19 Section 1 NEC. 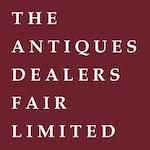 Antiques for Everyone is the largest and most established vetted art, interiors and antiques fair outside of London. An inspiring array of diverse categories of beautiful, unusual and rare objects from antiquity to the present day. At the Decorative Antiques & Textiles Fair in the Battersea Evolution, you can find a wide range of decorative antiques and twentieth century design. Formal antiques, collectors’ items, art and accessories from the 20th century to the quirky. Petworth Park, Petworth House, Petworth, West Sussex GU28 0QY. A stately mansion nestled in the South Downs, housing the most exquisite art collection in the care of the National Trust. Discover the wow factor for beautiful jewellery. This show is a vital part of House & Garden Festival. Antiques, design and garden trends combined. How good is that! Buy with confidence from an inspiring array of over 30 categories of beautiful, unusual and rare objects from antique to the present day. I will show part of the Precious Flora collection in TIMEWISE Vintage Watches stand A11 at the Decorative Antiques & Textiles Fair. 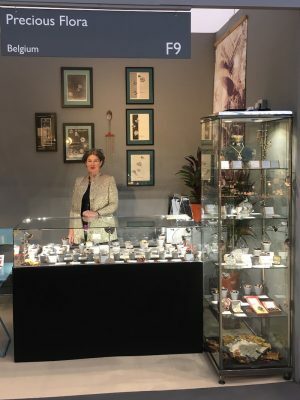 15-18 November 2018: Birmingham Art and Antiques for Everyone Winter Fair. 29 October- 4 November 2018: Winter Olympia Fair T he Art and Antiques Fair Olympia 2018. One hundred leading specialist exhibitors showing a treasure trove of over 33,000 vetted items to buy and an impressive line-up of speakers in this year’s talk programme. 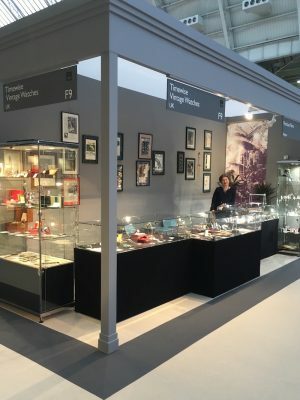 2-7 October 2018: BATTERSEA PARK at the stand of TIMEWISE Vintage Watches at the Decorative Antiques & Textiles Fair. 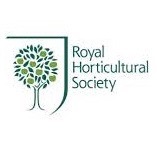 This London Show in the beautiful halls from the Royal Horticultural Society will be showcasing the very best of botanical art and photography. 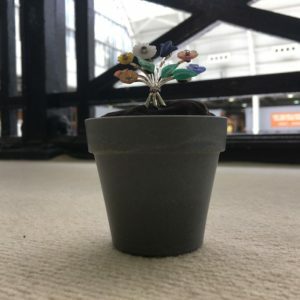 In addition to the competition artists, there will be an array of exhibitors showcasing beautiful seasonal plants, plant-inspired design, arts and crafts in the stunning art deco Lawrence Hall, stand 416. Hosting 160 dealers, the Fair will showcase a vast array of items from antiquity to the present day. This year the show is a vital part of House & Garden Festival. Antiques, design and garden trends combined. How good is that! 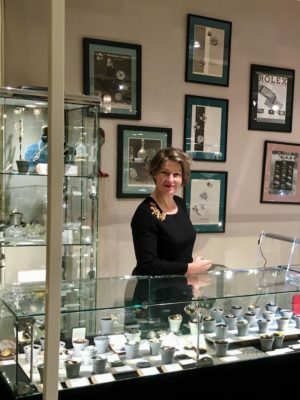 17-22 April 2018: BATTERSEA PARK collaborating with TIMEWISE Vintage Watches at the Decorative Antiques & Textiles Fair. 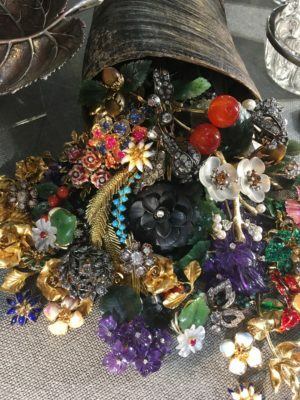 5-8 March 2018: The Kensington Antiques, Art & Design Fair at Kensington Town Hall. An antique fair set out in a spectacular country house, surrounded by historic parkland, easily accessible from London and neighbouring counties Hampshire and Surrey. The London Marriott Hotel Grosvenor Square, Duke Street, London W1K 6JP. Link to the press release sept. 2017 mentioning Precious Flora. A double page spread about the fair in The Gentleman Magazine included an image of the Sunflower brooch and text about Precious Flora. Winter Olympia Fair The Art and Antiques Fair Olympia 2017. 16-17 October 2017: The Little Chelsea Antiques Fair at the Chelsea Old Town Hall on King’s Road London.